A luxury accessory… or something more? I used to think that riding with cold hands was just plain irritating and uncomfortable but it wasn’t only about comfort and luxury. Coldness numbed my brain robbed me of dexterity and without that vital edge of concentration placed me one step closer to an incident. Surely there was something better than my collection of gloves in assorted thicknesses and styles? A quick bit of research provided the answer; heated grips, but which type should I buy? Oxford Heated Grips are designed to keep your hands warm but first ask yourself, ‘Do I really need them?’ If your winter gloves or handlebar mitts already do the job then perhaps you don’t. However, many riders report a secondary benefit of the Hot Grips… they grip; often way better than their shiny, brittle stock grips that slide worryingly through their gloves. These grips are suited to riders who commute or endure long spells on the road during the colder months. They’re also a great back-up for when that intended short journey isn’t quite as short as planned. Having your hands warmed from the grips allows you to feel comfortable, in control and free of distractions. There’s a price to pay with thick gloves and mitts; less feel and control especially when operating small buttons or a touch-screen GPS device. Thin gloves worn with heated grips restore your dexterity and reunite you with the solid feel of your beloved machine. 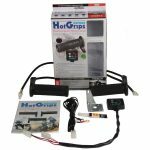 Oxford Hot Grips work via a simple handlebar-mounted control which is connected with electrical cables directly to the motorcycle battery. The rider can adjust the temperature over a number of different settings which is very handy should the weather change or if you misjudge the thermal properties of your gloves. Open the product box and you’ll find all of the components necessary to install the unit. It’s not a heavy install and well within the grasp of most new riders. Here’s a video which shows how to fit the grips. The process of hypothermia is an insidious one. It begins as an irritating complaint but left unchecked leads to more serious and life-threatening conditions. Even in its early stages, it’s enough to affect a rider’s concentration beyond what is considered safe. Riding with distractions takes your mind off what matters most; concentrating on the road ahead and enjoying complete control of your bike. Heated grips help remove that problem by giving warmth to the palms of the hands. It’s still possible to feel the cold around your fingertips but with a continuously powered heat source, the benefit is immediately effective. The grips come in a variety of models such as Sport, Touring, Adventure and Scooter. The Sport grips, in particular, have great gripping characteristics and some riders have purchased them for that reason alone. Oxford allows you to buy separate items such as new rubber grips which are very handy if your existing ones get damaged or worn through excessive use. It’s 7 am when you start your bike. You wait a few minutes while it warms up watching the ice and condensation drip from the metalwork. Soon you’ll be accelerating down the road riding into the wind, enjoying the waking process a little longer and of course, even in cold weather, the undeniable pleasure of motorcycling. Your hands are warm, your head is clear and your thoughts are where they should be… on the road ahead. Oxford’s Hot Grips provide adjustable warmth with which no gloves can compete. Unlike the heated grips of yore, they install simply and won’t drain batteries of critical voltage. They are a permanent and elegant solution to the stinging pain of frozen hands.